I’m Sorry Messages when you need to let someone know how you feel. How can I begin to say I’m sorry? Please find it in your heart to forgive me. I am so sorry, I never meant to hurt you. I hate fighting, and I’m sorry for my part of this one! Please forgive me. Hope you consider trying to forgive me. I hurt you, but I didn’t mean to… Please forgive me! I just wanted to say that I’m sorry for hurting you, and if you have it in your heart to forgive me, I want us to start anew. Please accept my sincerest apologies for hurting your feelings. Wow, did I ever mess up. Please accept my apologies. I sometimes say things I don’t mean, please forgive me. I’m so sorry for hurting your feelings – I take back my words! Hope you’ll forgive me! I wish I could turn back time and make things right. Please accept my humble apology. I would hate for our friendship to be lost. Please forgive me. I wouldn’t have made a mistake with my mouth shut. 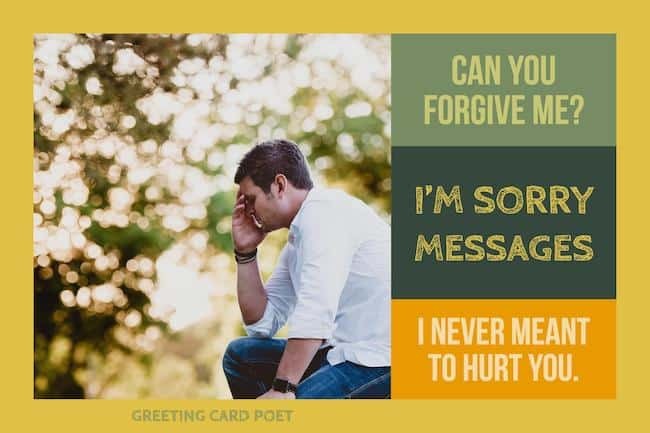 I’m sorry, I hope that you can forgive me. If I had to do it all over again, I wouldn’t. I’ll never forgive myself…but I’m hoping you will. So sorry, please forgive me. It was all my fault, please accept my apology. I’m soooooooooooo sorry. Please forgive me. I’m sorry. I’ll never forgive myself… but I’m hoping you will. I’m very, very, very sorry. Check out the “I’m Sorry” show. Please accept this gift in place of the words I said. I’m truly sorry. We may not have it altogether but together we have it all! Please lets start over. Will this gift lets me out of the doghouse? I’m sorry. Let’s make up. Wish I could turn back the time and make things right… Please forgive me! You’re on I’m Sorry Messages.